With over a billion users, YouTube is undoubtedly the most popular video hosting and sharing service on the Internet today. However, that doesn't mean there aren't other similar services that people like. For example, Vimeo boasts of over 170 million users, a figure that may pale in comparison with YouTube's user base, but you can't ignore it for sure. Usually, people choose one service (YouTube in most cases) and stick to that for their daily usage, and it's hard to persuade them to use any other service once they get used to the one they have chosen. However, there are some software applications that make this whole process of trying different services less complicated and time-consuming. 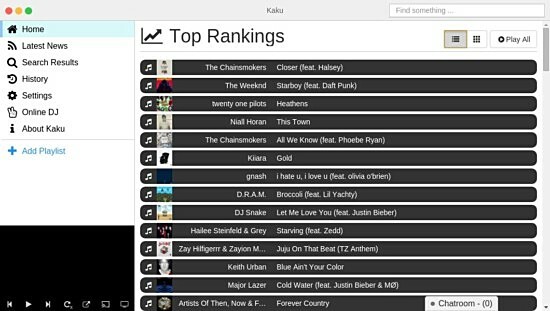 In this article, we will discuss one such application - dubbed Kaku - that supports multiple services including YouTube, Vimeo, and SoundCloud. Please note that all the commands and instructions mentioned in this tutorial have been tested on Ubuntu 14.04 and Kaku version used is 1.7.0. 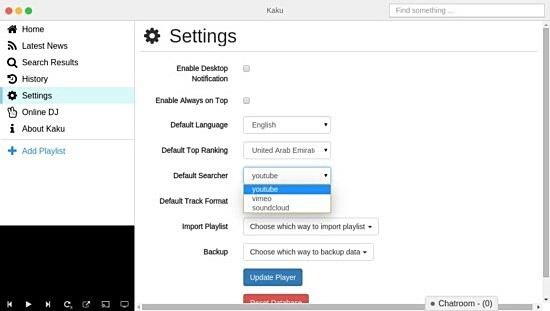 Available for several platforms, including Windows, Mac OS, and Linux, Kaku is a desktop application that lets you easily access video/audio content hosted on popular online services such as YouTube and Vimeo. 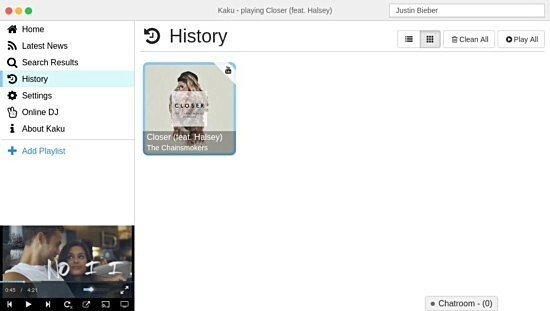 "With Kaku, you can easily listen to all kinds of music with just a few simple clicks and don't need to leave this desktop application," the project's official GitHub page says. Kaku also has a dedicated website in case you want to know more about it. 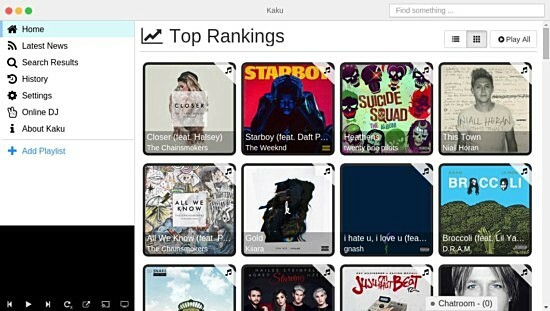 Downloading and installation of Kaku is very easy - just head here and download the application for your platform. For example, I downloaded the Linux32 package. 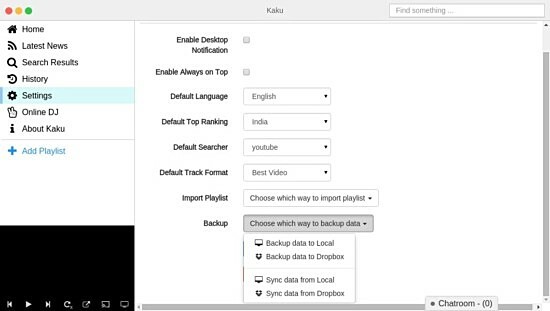 Clearly, Kaku has an eye-pleasing interface that's divided into a small left pane containing options available to user and an area for videos on the right. By default, videos appear as thumbnails, but you can also view them as list by clicking the list button on the top-right area. The player offers options to play the video in TV mode as well as full-screen mode. You can also cast the video being played to a device. Moving on, there's a search bar on the extreme top-right corner of the window where you can put in a query if you want to search for a particular video. The Search Results option brings up the results of your last search. The History option brings up the list of videos that you've played. 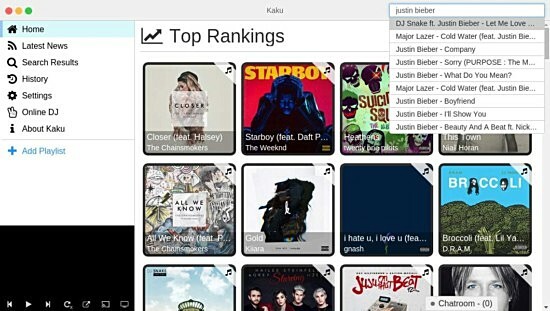 You can clean your Kaku history by clicking the Clean All button present on the top-right. Next up, the Settings option brings up all the customization options that the application offers. For example, you can enable desktop notifications as well as make sure that the application window is always on top. 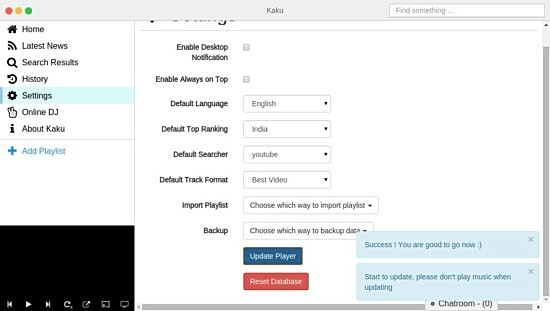 Then there are drop down menus that let you set default language, top ranking based on region, track format (audio or video), as well as the online service you want to use. 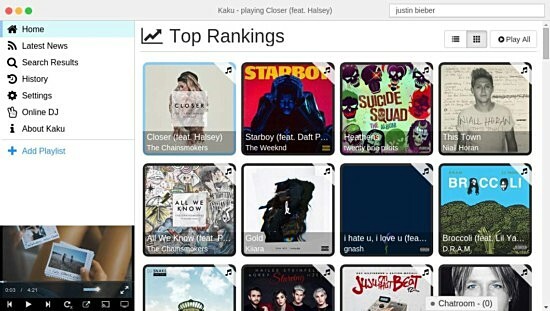 Please note that to apply any change that you make here, you need to click the Update Player button at the bottom. For example, when I changed the value of Default Top Ranking from UAE to India, and clicked the Update Player button, the application issued two notifications letting me know that I shouldn't play anything until the update process is over. 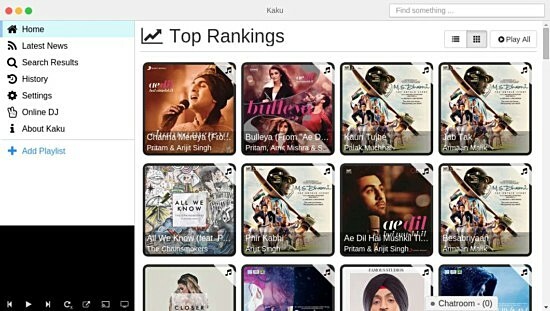 After the update, when I again clicked the Home option, I could see top ranking videos in India. Coming back to the Settings window, the last two settings allow you to import a YouTube playlist and back up data, respectively. Below the Update Player button, there's a button that reads Reset Database. Frankly speaking, I am not sure what it does as when I clicked it, the application froze and I had to restart it - may be the feature isn't working properly at the moment. That was all about the Settings option. 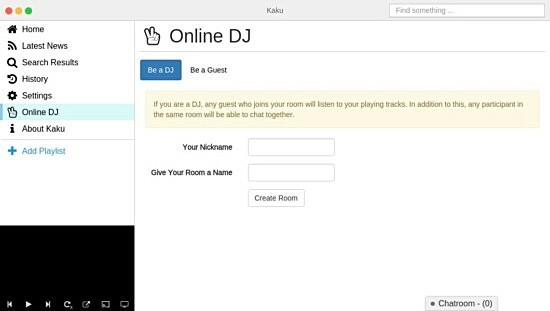 Moving on, the next option in the left pane is Online DJ, which allows you to create a virtual room. 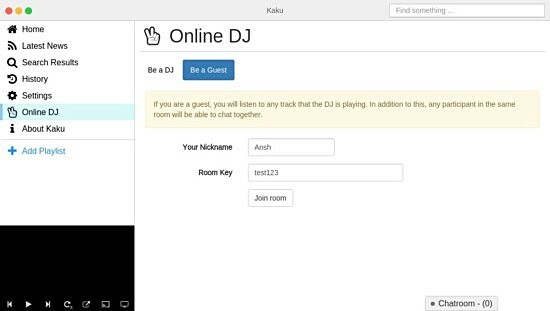 Users will be able to join your room as guests and will be able to listen to whatever you are playing. Those in the same room will also be able to chat with each other. To join someone's room, you need to know the room's key. 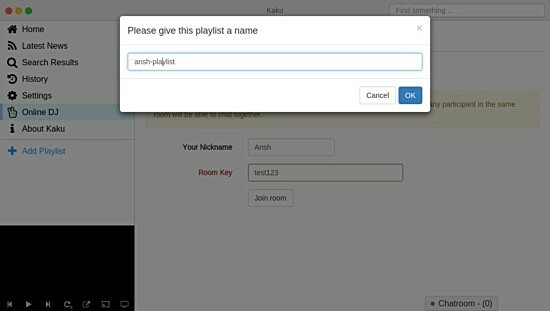 Finally, Kaku also allows users to create their own playlists. 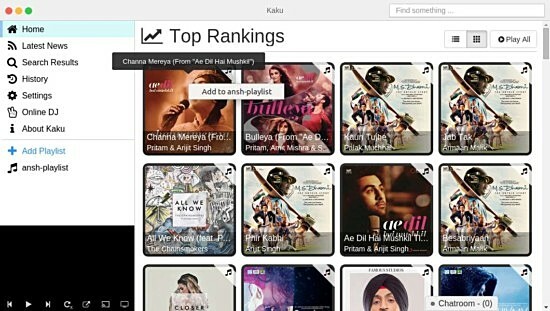 For this, click the Add Playlist option in the left pane, and enter the name of the playlist you want to create. This will create an empty playlist. To add contents to a newly created playlist, just right click on any video thumbnail and click the Add option. Personally, I found Kaku quite promising. It's easy to download and install, the UI is smooth and eye-pleasing, videos play immediately, and there are several customization options as well (not to mention the option to choose from YouTube, Vimeo, and SoundCloud). However, on the flip side, the inbuilt player lacks the ability to manually adjust video quality for the best experience, some features like Reset Database didn't work for me, and sometimes the drop down menus in Settings window turned completely black. But these are minor bugs and shouldn't discourage you from using the application.